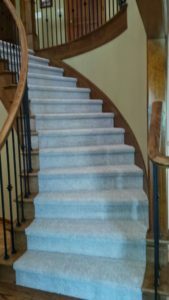 Do you need new carpet or flooring installed? Does your home have carpet stains, rips or pet dander smells? How about linoleum flooring? If so you are in need of an upgrade. Tearing out the old flooring and replacing with new carpeting or tile will make a huge difference in how your home feels when you walk inside. STAINMASTER® TruSoft®carpet is one of the top rated soft carpets on the market today. It has a luxurious feel under your feet as you walk around your home. TruSoft® carpet is manufactured from specially engineered nylon fibers to give it a super soft feel. Carpet tile is also called carpet squares or modular carpet and is an alternative to standard carpet rolls. The market share of carpet tile has grown significantly over the last couple of years. Historically it has been primarily used for commercial floor installation, but a growing number of residential carpet manufacturers have begun to market products aimed at the consumer. This is the designer’s choice for many commercial and residential applications. This unique product is the perfect combination of beauty, maintenance and durability. You can now have the look, graining, and character of real hardwood in LVT. Today’s manufacturing processes create amazing vinyl “wood” planks and textured “stone” tiles that rival the real thing. Luxury vinyl flooring systems use advanced realistic photographic technologies to replicate real hardwoods and stones. There are four layers fused together to produce the final product: a resilient vinyl backing, a vinyl color layer, a photographic film layer, and a urethane or aluminum oxide top layer. The protective top layer is very important to the durability of the product. Tile Flooring: Any realtor will tell you that tile flooring significantly increases a home’s resale value. The beauty of tile flooring lasts an extremely long time if it is properly maintained. Tile flooring is ageless especially when earth tones are used. Durability:Porcelain flooring is very durable and the tiles are difficult to crack. A quality installation can last for 10 to 20 years and even longer if well maintained. Water Resistant:Glazed ceramic and porcelain tiles have a non porous layer of liquid glass that sits on top of the tiles making them impervious to water and stain penetration. They are also naturally resistant to the ravages of high humidity conditions. These properties makes them ideal for use in wet environments like bathrooms and kitchens. Tiles that are not glazed will need to be sealed in order to protect their surface from liquids. Coventry Flooring is the home of the lifetime installation guarantee! Give us a call today to get started on a new look for your home! We are cash and carry only on all hard surfaces.